Please join C.W. 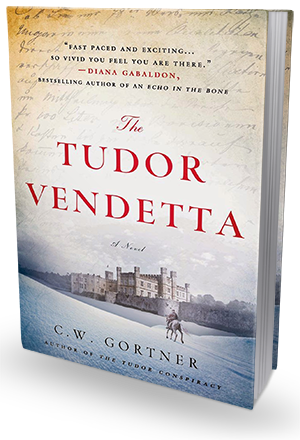 Gortner as he tours the blogosphere for the release of the third book in his Spymaster Chronicles Series, The Tudor Vendetta, from October 20 – November 28, and enter to win a complete set of the trilogy! With THE TUDOR VENDETTA, the third book in the Elizabeth I Spymaster series (Elizabeth’s Spymaster in the UK), I have concluded the arc of an idea that was first conceived over fourteen years ago. I’ve had many people ask me: Why this series? Why set a trilogy in the Tudor era with a fictional character, rather than an actual personage, as your protagonist? My other historical novels are rooted in historical fact, narrated by women who actually lived, so this series seemed an unusual departure for me. Now, with the third book in the Spymaster series published, I think it’s an excellent a time to explain. My fascination with the Tudors stems from childhood. When I was growing up in Spain, the BBC aired “The Six Wives of Henry VIII” and “Elizabeth R”. I sat glued to the television set like so many others, mesmerized by this most sumptuous and dangerous of historical periods. Later on in my early twenties, my first attempt at an historical novel was an epic about Anne Boleyn; I admired her as arguably the most compelling of Henry’s wives and an early feminist, who eschewed the established pattern for women to seize the greatest prize. While researching and writing that book, which took over six years, I came to realize that not only did Elizabeth resemble her mother in her dark eyes and slim build, her beautiful hands, and undeniable charisma, she too was an early feminist, refusing to marry so she could wield power alone, in an era when an unwed woman who was not a nun or widow, much less a queen, was rare. Though Anne was beheaded when her daughter was only three years old, a trauma which scarred Elizabeth for life, the ill-fated queen passed more than her genetics to her daughter: she somehow imbued in Elizabeth a determination to overcome every odd. Ironically, Anne’s inability to bear the son that might have saved her would fuel Elizabeth’s later infamous marriage game. It is beyond doubt that Elizabeth learned early in life that surrendering herself to a husband could not only be dangerous, but potentially fatal. I’d hoped to see my Anne Boleyn book published and follow it with a sequel about Elizabeth. It was my first manuscript to attract literary representation; strangely enough, it was also the one that earned me a fan in my editor, Charles Spicer of St Martin’s Press. He was unable to acquire my Anne Boleyn book due to diminished interest in historical fiction at the time, but years later, he would enthusiastically buy the Spymaster trilogy—which in of itself goes to show how first impressions in publishing can yield rewards. My struggle to become published would take another thirteen years and several manuscripts, all of which save my Anne Boleyn novel are now in print. By the time I returned to my lifelong interest in the Tudors, the market climate was propitious; historical fiction was experiencing a boon. However, Elizabeth herself had had reams of fiction and nonfiction devoted to her, and I wondered what I could possibly add to the deluge that would feel fresh. I’d also become enthralled by her earlier life, especially the tumultuous years following her father Henry VIII’s death, when, buffeted by changes of regime at court and her siblings’ disparate reigns, she charted a course of survival that would serve as a blueprint for her own unprecedented time on the throne. I realized that it was here, in the very crevices of history, via seemingly isolated events that nevertheless exerted significant impact, lay stories waiting to be told. The crisis following Edward VI’s death thus became the basis for the first book in the series, The Tudor Secret. This paved the way for Mary Tudor’s accession and the terrors of her rule portrayed in The Tudor Conspiracy. And now, in The Tudor Vendetta, I set out to explore the first months of Elizabeth’s reign, when her grip on her crown was still tenuous, and she had her own potentially fatal secret to protect. Though the Spymaster Trilogy, I’ve found a way to indulge my fascination with this most enigmatic sovereign without re-telling an already familiar story. But I also needed a witness; someone close to her but not bound to her household, free to move between her privileged existence and the seething underworld behind the tapestries. The idea to create Brendan Prescott, a foundling squire to Robert Dudley, who has a secret past he’s initially unaware of, seemed perfect—in Brendan, I found the ideal foil, a devoted, if somewhat unwilling, spy who runs afoul of Elizabeth’s intimate, Lord Robert, and finds himself thrust into the maelstrom of plots and counterplots that will bring her to the throne. Brendan is her one true friend, who grows to understand both her strength and weakness. He too is flawed, fighting to find a place for himself in a world where he feels he doesn’t belong. Through him, I had the opportunity to present a more nuanced depiction of Elizabeth’s contradictory nature, which often drove her advisors to distraction, yet was as much a part of her appeal as her generosity or wit. I also found myself exploring byways that a conventional approach would not have allowed: the squalid back-alleys and brothels of London, a winter crossing on foot of the frozen Thames, daring escapes from palace leads and sword-fights on London Bridge, as well as a multitude of supporting characters, intermixed with vibrant, real-life personalities, each of whom showed one face to the world while concealing another. In particular, I relished depicting Elizabeth’s controversial relationship with Lord Robert from the perspective of an outsider, who recognizes Dudley’s predatory ambition yet remains powerless to thwart it. Too often, Elizabeth and Robert are portrayed as star-crossed lovers; the truth is more ambiguous, fraught with peril. This very complexity is what makes their relationship so interesting to me. I am very proud of the Spymaster books. These are adventure stories, first and foremost, with mysteries at their heart, depicting actual events with a twist—set on the stage of some of the most dramatic yet neglected episodes in Elizabeth’s struggle to reach her throne, as seen through the eyes of one young man who yearns to do the right thing, and sometimes fails. For more information please visit C.W. Gortner’s website and blog. 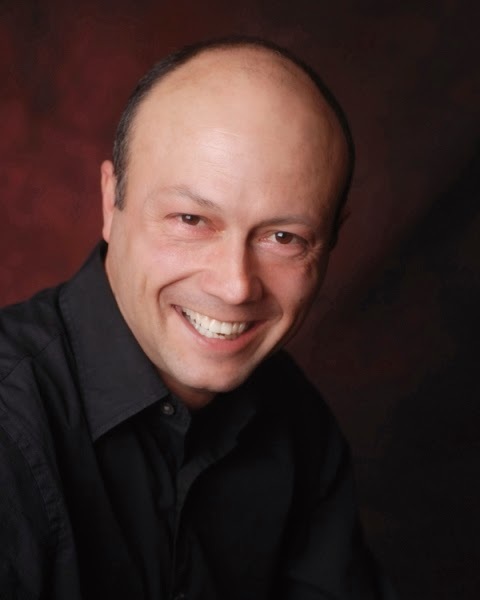 You can also connect with him on Facebook, Twitter, Goodreads,Pinterest, and YouTube.